What can you give somebody who loves to cook but has a lot of cookbooks you don’t want to duplicate? Maybe Best of the Best: The Best Recipes From the 25 Best Cookbooks of the Year: Vol. 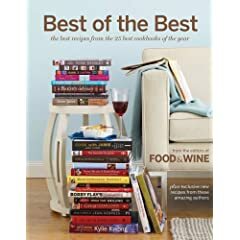 11 (Food & Wine Books, 287 pp., $29.95) www.foodandwine.com/books, edited by Dana Cowin and Kate Heddings.